The lifecycle of a portable air conditioning unit depends on how well it is set up and taken care of. There are several things you can do to keep your AC unit in the best condition possible for many years of use. The more you use a unit, the greater care and maintenance it requires to stay up for the challenge. Still, there are special requirements for portable AC units in storage. The following tips will help you get the most out of your portable air conditioner for years to come. “Location, location, location.” Usually, when people say this they are talking about real estate, but location is equally important for your spot cooler and how it operates. While portable AC units can be easily moved from one room to the next, there are some things to consider. For one, rooms that are dusty or dirty can lead to clogged motors, and ultimately electrical or mechanical problems. Take home lesson? Keep spot coolers in a clean space and clean them on a regular basis before dust has a chance to clog the insides of the unit. Units also need somewhere to vent out, ideally a window. Place in a well-circulated location with a window vent, or some type of vent. The power source attached to a spot cooler must be able to supply at least 120VAC—enough power to kick start the compressor and motor fans. Without the proper electrical hookups, there’s heightened risk for a busted fuse or shortage. All HVAC systems have one or more filters used to collect dirt and debris that would otherwise end up inside of your machine. There’s usually a pre-filter easily accessible on the backside of spot coolers. This filter should be cleaned at least once a month using a soft cloth. No soap or detergent should be used as they can create a film that leads to backups. What happens if you don’t change your filters? The accumulation of dust and dirt starts to mix with moisture from within the unit, creating a layer on coils that is surprisingly firm. Because of this firm layer, the coil cannot transfer heat outside and eventually the unit will overheat and break. Additionally, there’s usually another filter called the “carbon filter,” which is used to reduce odors. It is recommended to change this filter at least two times per year, or more depending on overall usage and the manufacture’s recommendation. It is very common for portable spot coolers to only get used one or two seasons a year. So, what do you do with it during the other months of the year? If you buy a spot cooler, it’s important to properly store it and then have it serviced before using it again. Make sure all moisture inside of the unit is collected, drained, and disposed of. Set the unit to high speed “fan only” mode for several hours before storing it. This ensures the unit moisture-free. Keep the unit secured in a cool and dry place. Cover the unit with a protective plastic sheet to prevent accumulation of dust and debris. Renting a spot cooler takes a lot of responsibility off your plate. For one, you don’t have to worry about making repairs or staying on top of maintenance—that’s our job! Additionally, it allows you to have a working and well-maintained spot cooler as needed, without worry over proper storage. 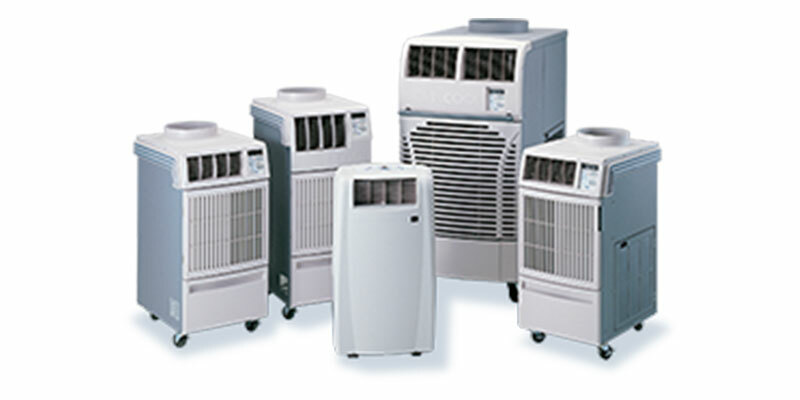 Upgrade to a larger or more advanced unit as needed without having to buy a new portable AC. Cooling Power offers great deals on spot coolers for rent and sale. We can help you identify the best spot cooler for your situation. Learn more about our large selection of air-cooled and water-cooled portable AC units for rent.